Over time, the exterior water hoses that were with your new washing machine may leak or burst. It's a good preventive maintenance practice to check these hoses from time to time for any sign of wear or weakness. Often there's a small blister in the rubber of the hose, which could rupture. Most manufacturers recommend replacing the hoses every 5 years. Most washing machines collect lint during the wash cycle and send it down the drain during the drain cycle. Most washing machines collect lint in the center tube of the agitator. You need to lift out that tube and clean it periodically. Other machines have a lint filter near the top of the tub, which you need to slide out, clean off, and reinsert. Your dryer vent pipe should be made of aluminum. The white vinyl duct that was common several years ago no longer meets most building codes, because if your dryer ignites it, a fire may start in your home. Check the entire length of the vent pipe for lint build-up at least once a year--or more often if the dryer gets a lot of use. Note… If the lint build-up is severe, it's important to disassemble the dryer and clean out the lint more thoroughly. This is often a job for a qualified appliance repair technician, because there's a risk of injuring yourself or damaging the machine. Manual defrost refrigerator/freezers require very little maintenance. When frost has accumulated on the inside walls of the freezer to a thickness of ½ inch or so, remove the food from the refrigerator/freezer, turn off the thermostat or unplug the unit, and allow all of the frost to melt. You don't need to manually defrost your self-defrosting refrigerator/freezer. Every 6 to 8 hours, it heats up its cooling coils slightly and melts any frost accumulation on the coils. The resulting water drains into a shallow pan at the bottom of the refrigerator/freezer. There's no need to empty the pan. The water in it will evaporate. But it may begin to smell bad over time. You may be able to remove it for periodic cleaning by detaching the lower grill and sliding the pan out the front of the refrigerator/freezer. Note… When mold grows in the drain pan, it is sometimes considered to be a health concern. If your drain pan is removable, and if you're sensitive to mold, consider cleaning the drain pan periodically. Under your refrigerator/freezer is a set of coils and a cooling fan that you need to clean at least once a year. The coils may look like a grate or like a wide radiator. Unplug the refrigerator/freezer and use a Refrigerator Condenser Brush (available in the accessories section of our website), and your vacuum cleaner to clean any lint, pet hair, and so on from the coils. The broiler pan that comes with most range/ovens is porcelain-coated steel. Clean it with a non-abrasive cleanser. Most range/oven control panels are glass and/or painted metal. You can safely use non-abrasive cleaners on these surfaces. Examples include the Range top Cleaner, from our accessories section under "cleaners" as well as glass cleaners and liquid degreasers. Note: Never spray cleaners directly onto the control panel. Instead, put some cleaner on a soft, damp rag, then wipe the surface. You can clean any porcelain cook top with a non-abrasive cleanser. Note: Don't pour the cleanser directly onto the cook top. Instead, put some cleaner on a soft, damp rag, then wipe the surface. You usually need to replace the drip pans or bowls beneath the grates on a gas stove/range and beneath the heating element on an electric stove/range every 2 to 3 years. That's because, once they're stained, it's usually not possible to clean them completely. Always clean glass and ceramic cook tops only with products made for this purpose--such as the Frigidaire Range top Cleaner we carry in our accessories section. You may be able to safely clean the knobs on your range/oven with a little dish detergent and a damp cloth. Remember to use care while cleaning the numbers so they wont rub off. If your oven is self-cleaning, consult the owner's manual for instructions on how to use this feature. The self-cleaning feature works by heating the interior of the oven to a temperature so hot that it incinerates the residue inside the oven. Air conditioners are equipped with a simple electrostatic filter in the front grill area to filter the air that passes through them. If your unit has a filter you should replace/clean it once a month during the cooling season. If the temperature outside the room where the air conditioner is placed becomes cool, approximately 60 degrees Fahrenheit or lower, check the coils on the front of the air conditioner to be sure they are not icing up. If they are icing up, turn the air conditioner off until the temperature rises. Air conditioners have a cooling system just like a refrigerator's. It is important not to turn the unit off and then back on right away. Wait at least ten minutes after shutting the unit off to allow the pressure in the refrigeration system to equalize once again. Avoid small rodents and flying insects from nesting in your stored AC unit by using a protective cover on the part of the air conditioner that sticks outside. The condensing coils on all air conditioners will accumulate dirt and dust. It will be necessary to remove the entire cover of the air conditioner to gain access to the coils. 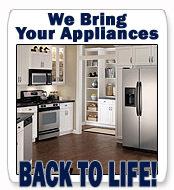 When any of your appliances breaks down, do not throw it away, just pick up the phone and call us today. We bring them back to life!